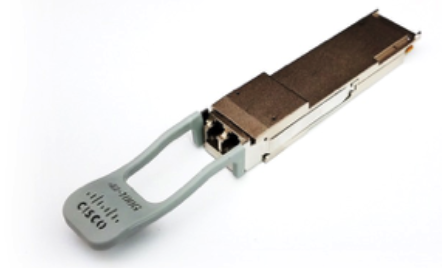 The trending QSFP+ 40G BiDi pluggable optical transceiver has been introduced by Cisco since 2015. It broke the mold by providing 40Gb connectivity over the same fiber format (dual MMF) as 10G SR. Until then, 40G SR4 was the primary option, and required four times more fiber and more expensive optical connectors. 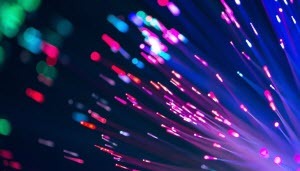 Data center traffic continues to grow, driven by increases in server activity, application density on virtualized servers, and demand for low-latency east-west connections between servers. When the popular QSFP+ 40Gb bi-directional (BiDi) transceiver was released, it enabled data center operators, for the first time, to upgrade from 10Gb to 40Gb without the need to replace fiber cable infrastructure. The next generation dual-rate BiDi, which has both 40Gb and 100Gb operational modes, offers the same benefits and more. The Cisco QSFP 40/100 Gb dual-rate BiDi transceiver can function as a 40Gb BiDi, matching its reach of 100m and 150m over OM3 and OM4 multi-mode fiber, respectively. In 100Gb mode, the dual-rate BiDi’s reach is 70m and 100m on OM3 and OM4, respectively. In both modes, the BiDi reach matches its SR4 counterpart. As a single transceiver with these two modes of operation, the Cisco dual-rate BiDi enables data center operators to re-use their existing duplex LC-connectorized MMF infrastructure for migration from 10 Gb to either 40 Gb or 100 Gb Ethernet connectivity, or migration from 40Gb to 100Gb. Figure2 shows the 100G BiDi Transceivers deployed in a leaf-spine logical architecture. Only Cisco offers backward compatibility with native 40Gb BiDi transceivers in a QSFP28 form factor. 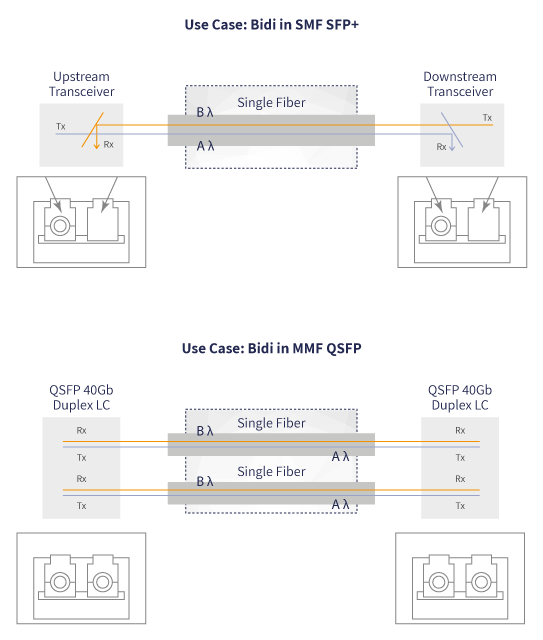 Like the native 40Gb BiDi, the dual-rate 40/100 Gb BiDi transmits bi-directionally on both fibers, using nominal wavelengths of 850nm and 910nm and passive wavelength division multiplexing (WDM) filters at either end to isolate Tx and Rx channels. In 40Gb mode, it transmits and receives 20Gb NRZ channels on each fiber, for a total aggregate bandwidth of 40Gb. QSFP28 form factor, to the 2x50Gb format for the optical domain. It also employs onboard forward-error-correction (FEC) to reduce bit error rate. This makes it possible to use current generation transmitter and receiver technology. 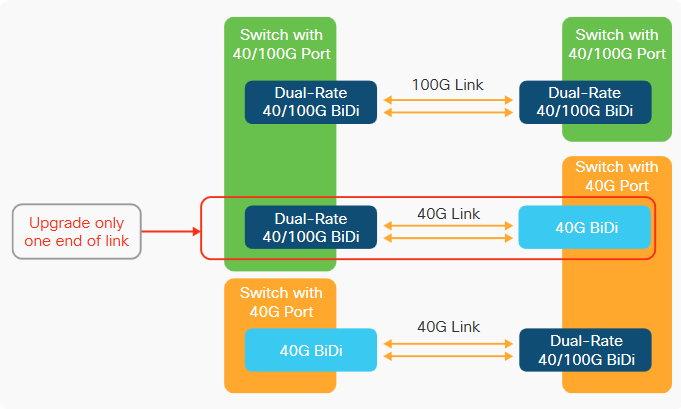 As shown in the figure, a dual-rate 40/100G BiDi plugged into a 40/100G switch port (green box on the left) can still link with a native 40G BiDi plugged into an older switch with a single-rate 40G port (orange box on the right). The dual-rate port on the left would be set to 40G mode in the switch software (see red outline in the figure). Once you’re ready to upgrade the other end, you can replace the 40G switch with a new one that supports 100G QSFP28 ports, like the dual-rate 40/100G Nexus switches. Just plug in the new 40/100G BiDi, tell the switch software on both ends to run the port at 100G, and you’ve completed the upgrade. More information can be found on the QSFP100 product family data sheet. A video on multi-rate ports can be found on the Cisco Optics playlist of the Cisco YouTube channel. Thanks to BiDi optical technology, a complete overhaul of your network is no longer necessary to support a 40Gb upgrade and provide sufficient bandwidth. A massive increase in connected devices: The Internet of Things (IoT) continues to expand, putting companies in a situation where they need additional bandwidth to handle the data these devices are transmitting and receiving. Big data continues to grow: Traffic in the cloud continues to increase as more companies look to take advantage of big data. Increase in applications being delivered as services: Companies no longer view software as a product, but instead as a service. This has seen a shift to online software solutions that require additional bandwidth to function correctly. Additional bandwidth is needed to support virtualization: More virtual machines are being used, placing additional strain on servers and the network. Network upgrades are necessary to ensure the smooth operation of your virtual machines. Data center traffic is becoming increasingly complex: Where data primarily travelled from the data center to the client and back, data centers are now shifting increasing amounts of traffic growth internally. Data centers require more bandwidth to keep traffic flowing smoothly. It allows you to make use of existing cabling so you don’t need to replace your existing infrastructure.